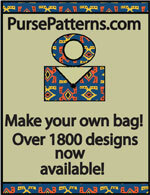 The Goin' Uptown Tote Pattern by Andrie Designs is a stylish tote bag pattern with instructions for a pieced outer panel so you have more options to design your own tote bag! 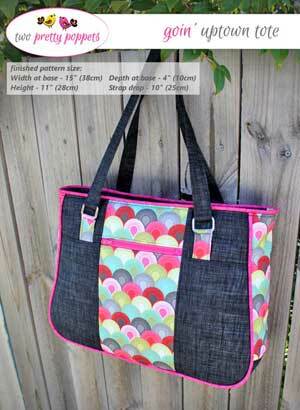 The Goin' Uptown Tote pattern is a large tote that can carry you through the day! The outer panels are pieced so you can show your imagination with that special fabric you have been saving. Features include an outer zipper pocket on the front and the back, a recessed zipper to close the bag, and an inner zippered pocket for added secure storage. 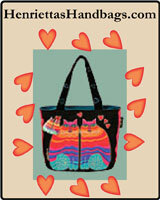 There is decorative piping around the sides and top of the bag for extra style and this tote makes a great diaper bag. The Goin' Uptown Tote Bag pattern has a total of 27 pages. There is a one page cover, 11 pages of instructions and illustrations, one page of bag photos, 1 page of labels for the pattern pieces, and 12 pages of pattern pieces including a large page to print at a local print shop if you prefer.